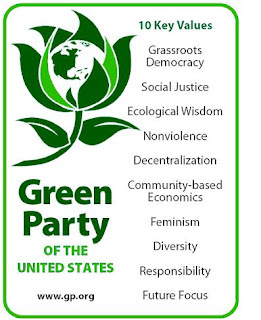 We Are The Ones We've Been Waiting For:: Green Party: ‘Whether you elect Democrats or Republicans, you’re getting a GOP agenda’ #GOTV2010 Vote #GreenParty! Green Party: ‘Whether you elect Democrats or Republicans, you’re getting a GOP agenda’ #GOTV2010 Vote #GreenParty! Democrats are shifting to the right and abandoning their progressive values, a top Green Party official charged in an interview, arguing the liberal standard-bearers can no longer be "rehabilitated" and voters ought to consider a third choice. "This is a very opportune moment to tell people that whether you elect Democrats or Republicans, you're basically getting a GOP agenda," Scott McLarty, a national spokesman for the US Green Party, told Raw Story. The Green Party, officially founded in 2001 with organizations across the country, has, like all modern third parties, been unable to muster up the clout to compete in major national races. But it has gradually made headway in statewide elections, and has hundreds of candidates running for offices next month. McLarty claimed the Democratic Party has largely gone all in with the GOP on issues such as war, civil liberties and military spending, and is moving to the right on major national issues such as health care and climate change. "Democrats are as likely to increase military spending as Republicans are now," he said, "and the Obama administration has maintained a lot of the worst policies of the Bush administration." Democrats' recent energy bills were designed to "serve polluters," he averred, while saying the health care law enacted this March was "not really a victory" as it was short on cost controls and embraced prior Republican ideas such as the individual mandate. Needless to say, there remain stark ideological differences between the Democratic and Republican parties, on issues such as taxes, social programs, torture, climate change and science, and a panoply of social issues. The core issue that separates the Democratic and Green parties, McLarty posited, is that the latter "takes no corporate contributions" and is therefore not indebted to big business. "The center of political gravity in this country is corporate money," he said. "Republicans are right on that center of gravity and Democrats are attracted to it." Yet many Democratic-aligned progressives, including those who feel more aligned with the Green Party's values, are extremely wary of jumping ship, fearing that Green candidates are not viable and their votes must be strategically cast to prevent the worst outcome. "We get that argument over and over again," McLarty said. "But the Democratic Party is not going to be rehabilitated. There's no hope for that at this time." Unlike the right-wing Tea Party, which has in the Obama era wielded significant influence working within the Republican Party, the Green Party isn't interested in playing nice with Democrats. "They can only see as far as the next election," McLarty said of liberals who insist on voting for Democrats. "The Green Party is looking at the rest of the century. Do we want the same dismal, limited politics of the two titanic parties?"